Skulboy Designs: DGR Ions have arrived! The design I did for Disc Golf Review.com was put up for pre-order to raise funds for the site. MVP stamped the design on their sweet, "over-mold" Ion putters and sent them out this week. These babies look and feel incredible, can't wait to get them out to the course. About the design. Seeing as many Disc Golf courses are installed in wooded areas across the world, I figured that if there was such a thing as a Sasquatch, he would be intrigued. 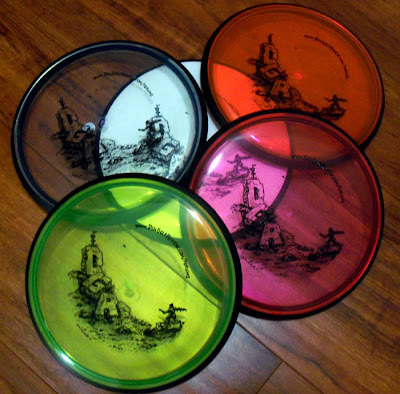 I'm sure one or two would eventually find some lost discs and give the course a whirl. Why not, right?